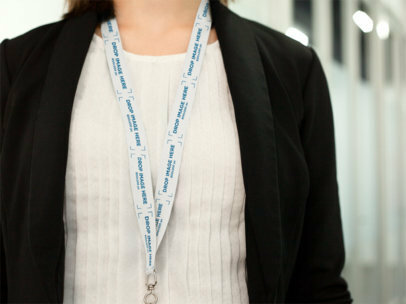 Check out this awesome mockup of an office girl using a lanyard while standing with her face cropped. Start using this image to showcase your company logo! Choose a lanyard color with the menu on the right, then drag-and-drop an image file of yours over the interface. You will be able to see the processed image a couple of seconds after that! Amazing, right? Try a Badge Holder Mockup! Take a look at how cool this close-up mockup of a young girl leaving the office is! All you have to do to use it is drag-and-drop a jpeg or png image file over the interface. That's right, that's all! You can also choose a lanyard color with the menu on the right side of the screen. How great is that? Start using Placeit to improve your company's image. Try another Lanyard Mockup here!